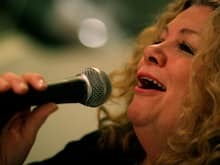 On Monday, September 15, the DC Cabaret Network had the honor of dedicating their monthly Open Mic to their beloved Terri Allen. The Open Mic was always seen as Terri’s “baby”; she nurtured it and kept it running through lean times and good. She loved keeping it available for people to try out new material, to hear their favorite songs in their voices and for newbies to take their first steps into the spotlight of the cabaret world. The Open Mic truly was and continues to be a unique venue in the DC area; primarily because of the efforts, devotion and dedication of Terri. We were delighted and moved that so many people wanted to participate in the evening. The Warehouse was packed with family, friends and long-time devotees of the Open Mic. Terri’s sister and brother, Barbara and Mike Allen were there, along with her niece, Hannah Jurs-Allen. The co-founder of the DC Cabaret Network, Wendy Lane Bailey came down from New York City. George Fulginiti-Shakar and Alex Tang generously shared keyboard duties, while Steven Cupo tried to fill Terri’s shoes as host. Not everyone who stepped to the mic sang, but instead gave a spoken tribute to the memory of Terri. Fellow DC Cabaret Network board members Lonny Smith and Cindy Hutchins, along with a few others, brought bubbly and refreshments to round out the evening. It was a night of laughter, tears and especially music. Literally and figuratively, it was a champagne toast to the life of Terri Allen. And, just as she would want it, the Open Mic will continue on.